Can I order shirts for my entire office? Yes, we offer over many different shirt colors and inks so you can choose which best match your practice! You can even customize the back with your office logo and up to 3 lines of optional information. When you order 25 shirts or more - a custom shirt back is FREE! So you've got that going for you, which is nice. Can I customize the shirts/flyers with my logo? Indeed. Simply upload a supported file type and fill in your information in the optional 3 extra lines. It's that easy! Do you offer kid sizes? The kids are alright by us. We offer youth XS-XL in every design. Our youth tees are Anvil 5.4 oz 100% Pre-shrunk Heavyweight Cotton. How's that for supporting the youth? We allow you to add to you quanity with a kid's order even if it's different colors. If you included a custom back, you will receive a proof within 2 business days of ordering. After receiving your email proof, you will then have 3 business days to respond with any revisions. If you don't respond within those 3 business days, your shirts will be sent into production as-is. If you like what you see, it's best to approve your proof as soon as possible so we can start production early. 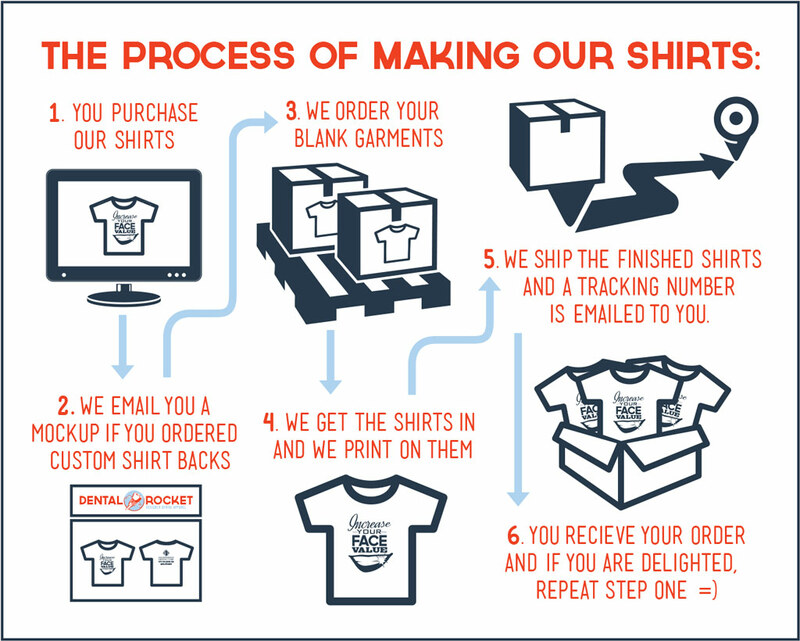 This way you can get those awesome custom shirts super fast! Well, that depends on the size of the order. Orders in the hundreds will take a bit longer than a 25 item order. It can take up to 14 business days for us to print and ship a custom order. If we think it will take longer, we will let you know. If you need your order in a jiffy, be sure to let us know before hand so we can try our best to meet your deadline. We're all about helping you! We usually have different offers to help you with that; they are advertised on various parts of our site, facebook, and our newsletter, and if you need more help, you can always contact us. Of course! We are open to any and all suggestions. Simply drop us a line at ! If we decide to use you it, we'll send you a free one. How many shirts can I order at a time? We love this question! Our shopping cart can only handle up to 1000, but we promise if you'd like to order more, we would be more than happy to work with you. It'll be fun, and discounts would certainly be involved. Do you ever add new designs? Designing is what we do best, so we will definitely be updating regularly. We love feedback on upcoming designs so be sure to like us on Facebook and check us out on Pinterest. Don't forget to sign up for our newsletter to stay in the loop and even receive exclusive discounts! or call us at 706.836.5836! We'll be happy to give you the 411 on your order. We can't resell products through our site that have been customized, so generally the answer is no. However, certain scenarios do arise where we may be able to work with you and come to a resolution that is fair to all parties. Simply give us a call at 706.836.5836, and we'll see what we can do. We accept all major credit cards and checks. Honestly, if you want to pay in gold bars, we can work something out. What if I have a question that isn't frequently asked? It happens. Just shoot us an email at and ask away.